Last weekend I was working just outside my walkout basement door when I heard a lot of loud, excruciating screeches coming from my back yard. Walking around the corner, I spotted a Red-shouldered Hawk circling over the woodland. Hearing one of these hawks is not atypical; a pair has been nesting in my neighbor’s yard for the past couple of years. 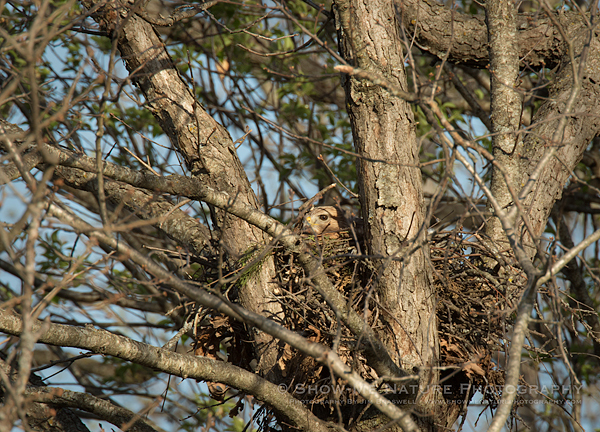 As I watched, the hawk circled for a few moments and then flew into the trees and landed on a nest. Within a few seconds, it hunkered down on the nest. Watching the nest for a few days, I am sure she is incubating some eggs right now. I don’t know if this is one of the hawks that used to nest at my neighbors, or if this might be one of their offspring nesting for the first time. Tags: 2017, behavior, bird photography, birding, birds, birdwatching, Blog, Cass County, hawk, Missouri, nature, nature photography, photography, spring.